The three volume-set, LNCS 10991, LNCS 10992, and LNCS 10993, constitutes the refereed proceedings of the 38th Annual International Cryptology Conference, CRYPTO 2018, held in Santa Barbara, CA, USA, in August 2018. The 79 revised full papers presented were carefully reviewed and selected from 351 submissions. 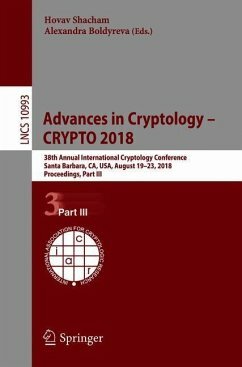 The papers are organized in the following topical sections: secure messaging; implementations and physical attacks prevention; authenticated and format-preserving encryption; cryptoanalysis; searchable encryption and differential privacy; secret sharing; encryption; symmetric cryptography; proofs of work and proofs of stake; proof tools; key exchange; symmetric cryptoanalysis; hashes and random oracles; trapdoor functions; round optimal MPC; foundations; lattices; lattice-based ZK; efficient MPC; quantum cryptography; MPC; garbling; information-theoretic MPC; oblivious transfer; non-malleable codes; zero knowledge; and obfuscation. Secure messaging.- Implementations and physical attacks prevention.- Authenticated and format-preserving encryption.- Cryptoanalysis.- Searchable encryption and differential privacy.- Secret sharing.- Encryption.- Symmetric cryptography.- Proofs of work and proofs of Stake.- Proof tools.- Key exchange.- Symmetric cryptoanalysis.- Hashes and random oracles.- Trapdoor functions.- Round optimal MPC.- Foundations.- Lattices.- Lattice-based ZK.- Efficient MPC.- Quantum cryptography.- MPC.- Garbling.- Information-theoretic MPC.- Oblivious transfer.- Non-malleable codes.- Zero knowledge.- Obfuscation.